When I get into the desktop of my laptop running on Windows Vista, I found that the volume icon is grayed out on the system tray. Due to that, I am not able to adjust the volume of the system. How can I fix up this issue with ‘Volume’ icon? 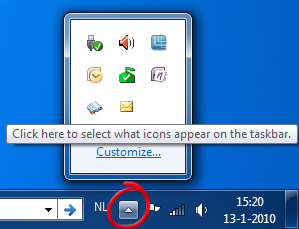 How to enable again the icon which is missing from the system tray in Windows 7 OS? You need to right click on the task bar and wait until a set of options appears on the screen. Click the ‘Properties’ option from that group. On doing so, you can view ‘Taskbar and start menu properties’ tab on the screen. Go to the ‘icons’ section and press the ‘Customize’ button under it. Find out the grayed out icon and check it’s status. The status type will be shown as ‘Hide icon and notifications’. Change that type into ‘Show icon and notifications’ so as to view the Volume icon without any issue. Right click the task bar and then click task manager and then click the processes tab then fine 'EXPLORER.EXE' then end process then you task bar should disappear after that click on the applications tab and then 'new task...' and type 'EXPLORER.EXE' it should appear. 1. Click the notification area button as shown below and click customize. 2. In that select Show icon and notifications for volume. It might have been kept default as hide icon and notifications. Follow these steps for solving this one. Go to Start menu and Click on Control panel. Then select the option customize icons on the task bar. Now click on Turn system icons on or off. Now chose volume icon and click and set it.